434 people pledged $80,628 to support this project on Kickstarter. The Cause Collective, In Search of the Truth, 2016. Photo courtesy of the artists. 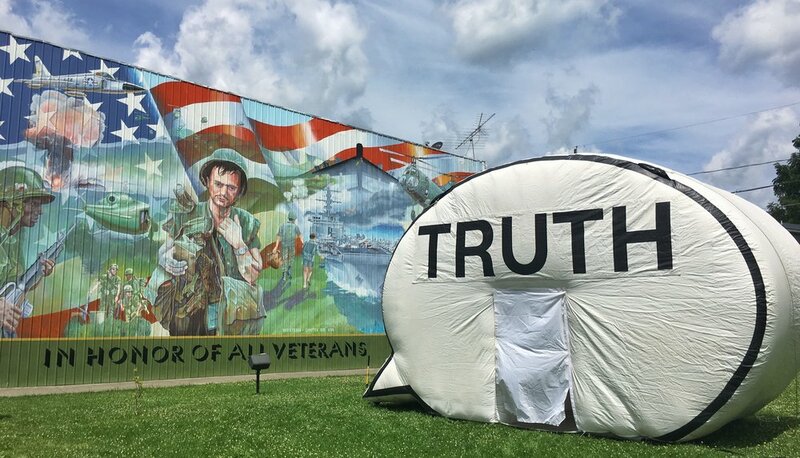 In the months leading up to the 2016 presidential election, the Cause Collective used Kickstarter to rally a community of supporters to help them bring their “Truth Booth” to more than 30 U.S. states. Members of the public were invited to step inside the inflatable video-recording booth, shaped like a giant speech bubble, and record short testimonials inspired by the phrase, “The truth is.” Thousands of people participated, generating a vast archive of personal thoughts, dreams, hopes, and fears — as well as a collective portrait of the American consciousness at a pivotal moment in history. Over the next several years, the project will travel to communities around the world, collecting even more diverse and intimate perspectives on the truth.